This is one of the nicest bar cookie recipes I have ever had. Not only are these dainty bar cookies attractive to look at, they are also wonderful to eat! The recipe comes from a fantastic cookbook called Robin Hood Baking: Over 250 Recipes from Robin Hood’s Baking Festival and Home Baking Cookbooks . Combine 1 1/2 cups (375 mL) flour, the brown and granulated sugars, baking powder, salt and cinnamon in mixing bowl. Mix well. Using two knives, a pastry blender or your fingers, cut in butter until the mixture resembles coarse crumbs. Add egg and almond extract. Mix with a fork. Transfer 1/2 cup (125 mL) of the mixture to a small bowl and set aside. Press the remaining mixture into a greased 9-inch (2.5 L) square cake pan. Spread jam evenly over top. Add 2 tablespoons (30 mL) flour to reserved mixture and stir to blend. Stir in water (about 1 tablespoon/15 mL) until the dough holds together. (It will resemble pastry dough.) Divide the dough into 12 portions and roll into pencil-like strips. Crisscross the strips diagonally over jam to form a lattice. 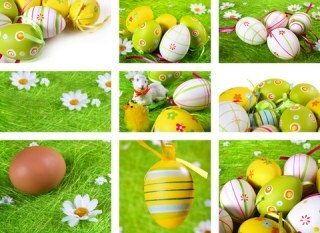 Mix the egg yolk with 1 teaspoon (5 mL)of water in a small bowl. Brush over lattice. Bake at 375°F for 25 to 30 minutes or until golden. Cool completely in pan on rack, then cut into bars. The strength and flavor of almond extract varies considerably among brands. It’s best to use a smaller amount the first time you bake with an extract, then gradually increase the quantity to suit your taste. Both salted and unsalted butter work well in baking. In most cases, they are interchangeable – it just depends on what you are accustomed to. Choose a jam that is thick for this recipe. Using a fork, rather than a spoon, to mix the dough helps keep it crumbly. If you use a spoon, it is tempting to make it smooth, which you don’t want. Bar cookie recipes usually freeze well and this recipe is no exception. If you are familiar with the Austrian Linzer cookie, this is very similar. 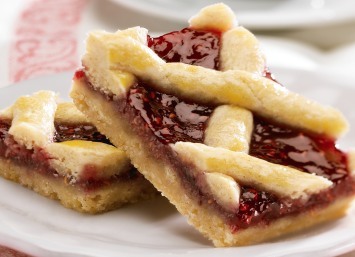 It takes the wonderful flavors of the Linzer cookie and put it into a bar format. It is easy to make and the results are simply delicious. This recipe for raspberry bars would make a perfect holiday or Christmas cookie and will be beautiful mixed with other cookies on a holiday dessert tray. Look here for another of our bar cookie recipes.